Inspiring produce abounds at the Santa Monica Farmers Market every Wednesday. If you arrive early enough there is a chance of shooting some great pictures before the later crowds block the stalls from a clear view. Some very fine and limited quantity items sell out in the first few moments after the market opens, usually to some chef from a very good restaurant. One week I arrived a few moments too late to purchase some miniature purple cauliflowers that would have looked spectacular on plates for individuals. Last week and I assume going forward Rainbow chard seems in abundant supply. 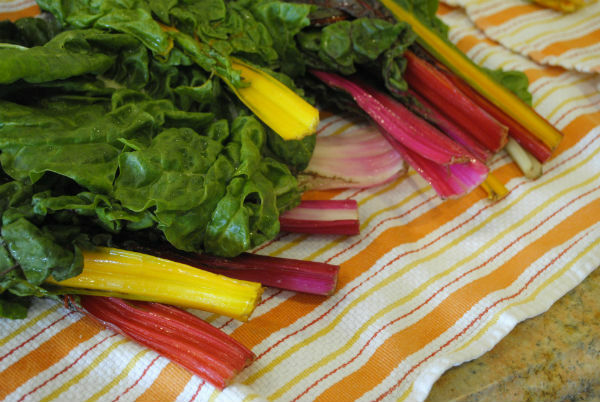 Rainbow chard is aptly named Swiss chard but with a rainbow of different colored stems, including, fuchsia, red, orange, yellow, purple and white variegated. I had to buy some since the intensity of colors was so amazing. Now what to do with all of that lovely Swiss chard? How about chopping it up, mixing it with cheese and baking inside Bulemas? Sounds yummy. I have a question for you my readers. 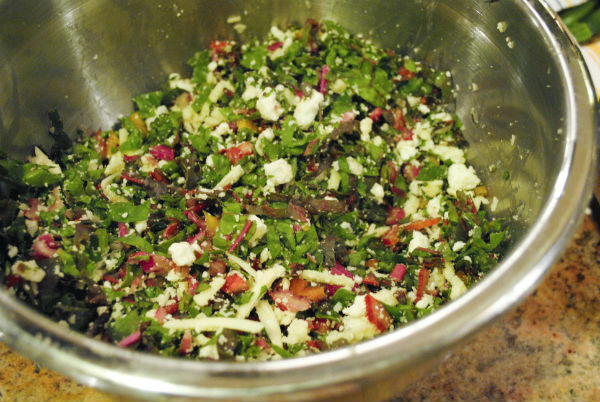 What actually makes a recipe or dish Sephardic? Is it a style of cooking? Does it mean only dishes I ate as a child that my Nona brought from Turkey? Can it include dishes that I cook and bake, being Sephardic, which keep to a certain way of presenting or stuffing, or cooking method, or spices, or flavoring? 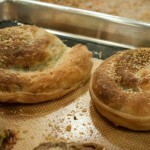 What is Sephardic food going forward? Does Sephardic food include dishes that were brought here to the United States and have gone through generations of adaptation through using local produce and ingredients? Does it include Israeli dishes and does it include the cuisine that can be made kosher from countries like Morocco, Egypt, Turkey and other countries that ring the Mediterranean? 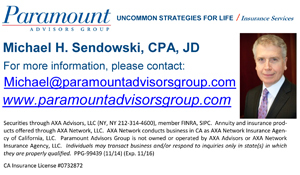 I would be interested to hear your opinions. In a two cup glass measure, combine yeast, sugar, salt, oil. Add 2 cups of warm water and stir. Place flour in a large mixing bowl or bowl of a food processor. After the yeast and water mixture begins to foam (about 8 to 10 minutes), add the yeast water to the flour and process for 60 seconds. If mixing by hand mix and then kneed until dough is smooth and elastic. Dust a rimmed baking sheet with flour. 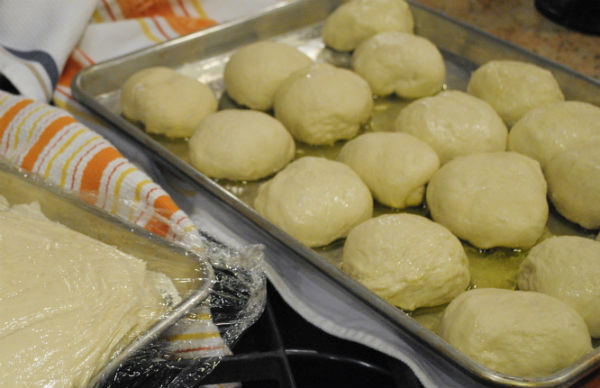 Divide dough into 4 round balls, flatten them into discs and set them in the baking sheet. Spray a piece of plastic wrap with oil or non stick baking spray and loosely cover baking sheet. Place a tea towel on top of plastic wrap. 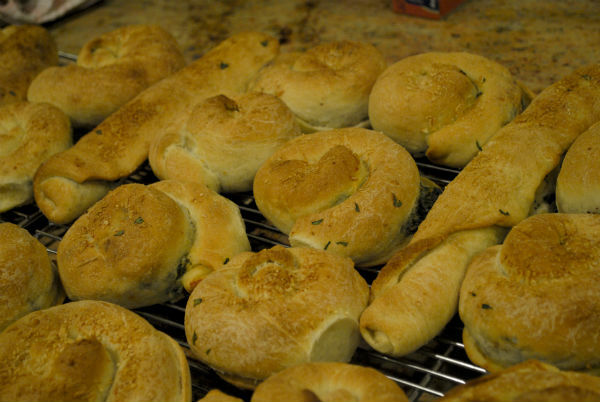 Set dough aside to rise for about 2 to 3 hours in a cozy place. 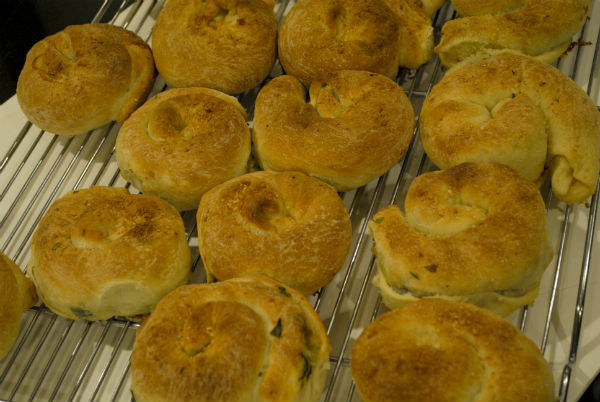 While the dough is rising prepare filling and line two rimmed baking with silpats or parchment paper. Pour 1/ 4 cup of remaining olive oil in a third baking sheet. To make filling place dry chard leaves in a stack on cutting board. Slice into thin ribbons with a sharp knife. 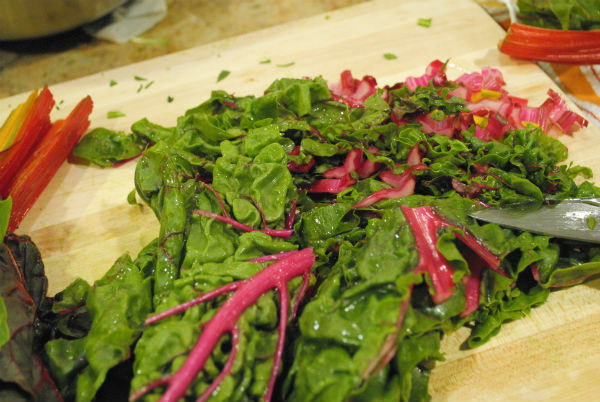 Slice the opposite direction to finish dicing the chard and place in a large bowl. Crumble feta cheese; add cheddar, Parmesano, and kasseri. 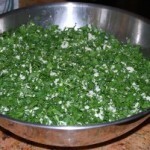 Gently toss cheese and chard to mix and set aside until ready to use. 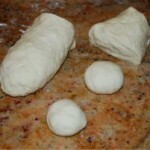 When dough has risen for about two hours, punch it down and divide each ball into 3 to 4 pieces each. Roll each piece to make a flattened ball and set balls in rimmed baking sheet with oil. Cover dough with a tea towel and let dough rise a second time only for one hour. Heat oven to 400 °F. Working on a wood or stone work surface, gently stretch each ball of dough first into a flat oval and after 5 minutes stretch it out to a rectangle about 10 inches by 7 inches. Dunk your hands in the remaining 1/ 4 cup oil to facilitate the stretching. I stretch about 5 at a time, let them rest and then go ahead a stretch them all the way out. 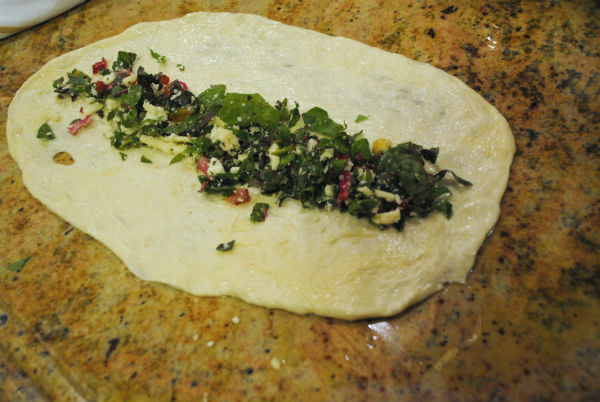 Take a scant handful of filling or about 1/ 3 to 1/ 2 cup and spread it in a narrow line along the long side of the dough about 2 to 3 inches from the edge. Roll up bulema into a long cylinder and coil into a circle like a cinnamon roll. Place on silpat lined baking sheet. Sprinkle with remaining Parmesano. About what constitutes Sephardic cuisine, this is a very big question. I think it’s up to you whether you choose to define it broadly or narrowly. It’s the kind of question that always comes up when someone is cooking a traditional cuisine outside of its “mother country”, such as Chinese cuisine in the U.S. In your post, for example, the form of this pastry is traditional Sephardic but I assume that the addition of cheddar is yours. 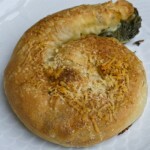 To me it is still Sephardic even if they didn’t use cheddar in Turkey. Hi about the cheddar, I think in Turkey or Rhodes, they probably used Kashkaval. Since it is so hard to find a kosher Kashkaval I enjoy the taste of, many years ago I began substituting a sharp cheddar, kosher, that mimics the salt content provided by the kashkaval. And so the cuisne evolves.